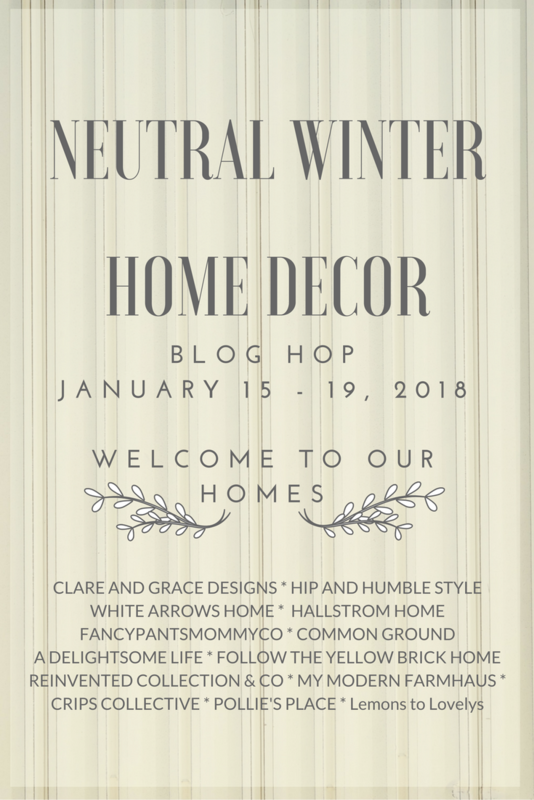 Hello Everyone, and welcome to Day 3 of the Neutral Winter Home Decor Blog Hop! If you're coming from Jaclyn's blog, Fancy Pants Mommy Company I'm so glad you're here! With all the weeks of Christmas decorating we all did, I know I was really ready for a different look around the house on January 1. I always look forward to putting all the Christmas decor snug in their tubs waiting for next season. A little space to breath and a fresh clean look is a positive way for me to start the New Year. 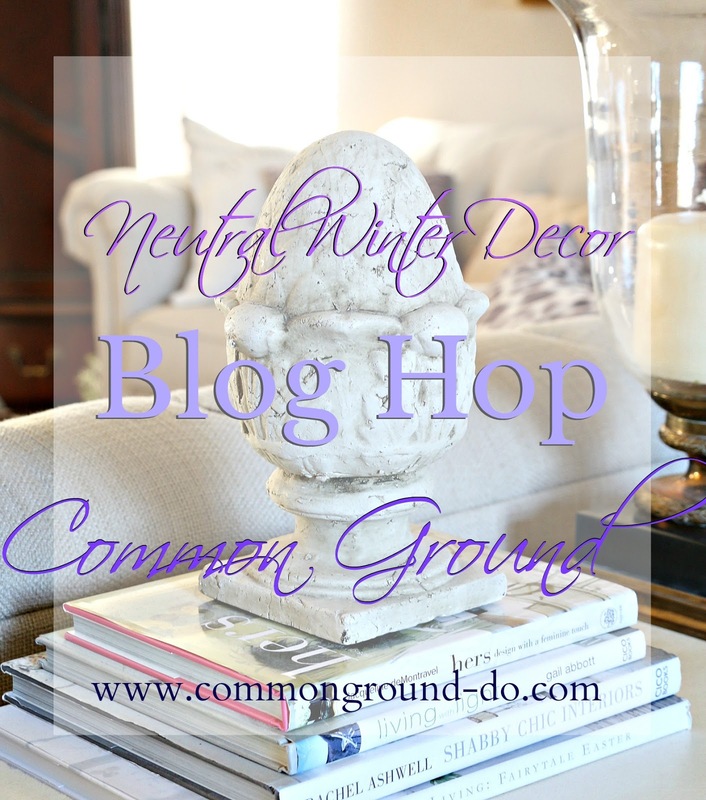 If you ask 4 different bloggers how they would define "Neutral Winter Decor" I imagine you'll get 4 different answers to the question. To some "neutral" means all whites, or a combo of whites, grays, and creams. To others it may mean using a variety of lighter hues and tones to bring a calming, peaceful feel to their surroundings. I like a mix of the latter, using mostly a lighter palette, but definitely bringing in some colors of nature that "mix and match" with grays, cream, and my new favorite shades of "mushroom". 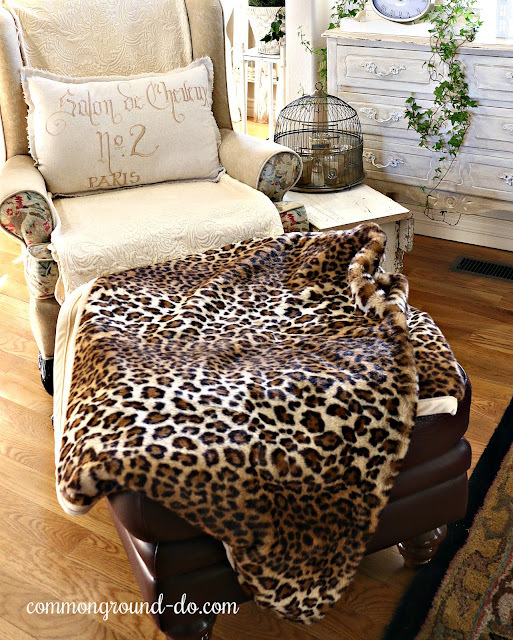 You might be wondering how I can manage to sneak in a leopard print throw and pillows here in the Living Room, and still call it "neutral". But to me, leopard is a print that can go with so many color palettes and other patterns I just automatically call it part of a neutral scheme. It also brings in the feel of warmth and coziness I think we're all looking for our homes during these cold winter months. with a magazine, a good book, or journal. If you're a regular reader of my blog, you'll know that we bought this house over 3 years ago, and since it has very "open concept" spaces, it's important that colors and furniture flow from one room to the next. 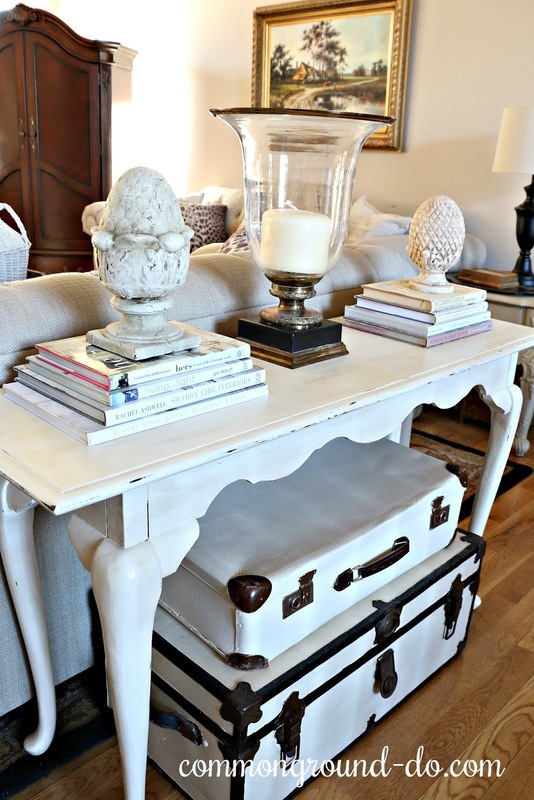 I painted my coffee table and two end tables white several years ago, but when we moved here they needed to be as close to the colors of the sofas that they could be. 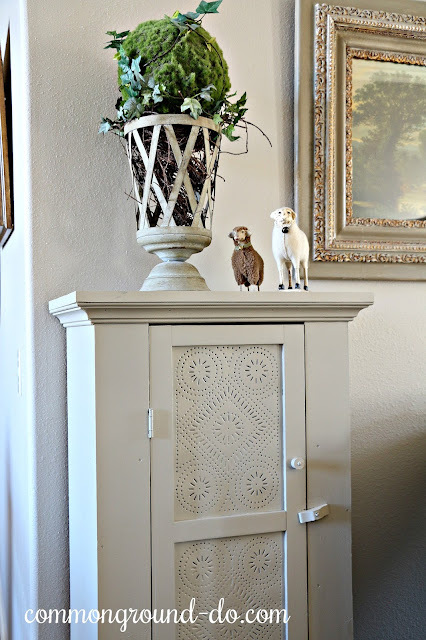 A mix of Annie Sloan Chalk Paint helped tone down the bright white and let them fade into the wall color. I just add in color with pillows, throws and light decor to accompany the current season. I usually keep the bigger pieces neutral, in this case my sofas are sort of a gray/beige linen fabric that can get comfy with green if I let it. The Leopard print pillows are a natural way to change up from the traditional red Tartan Plaids and Toiles of Christmas. 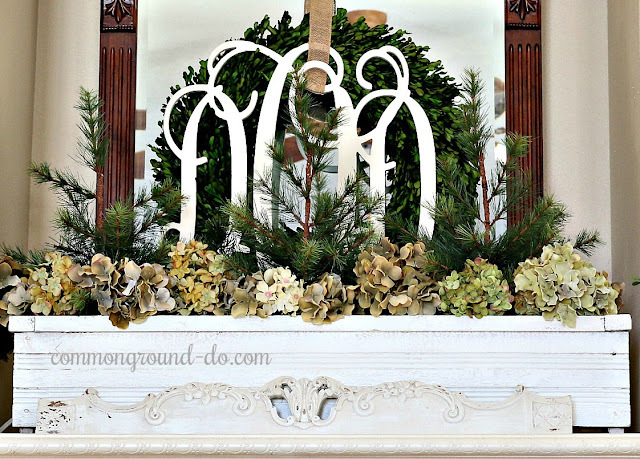 This year I started with more nature inspired elements for my Christmas decor and layered them for easy Christmas de-cluttering after the Holidays. 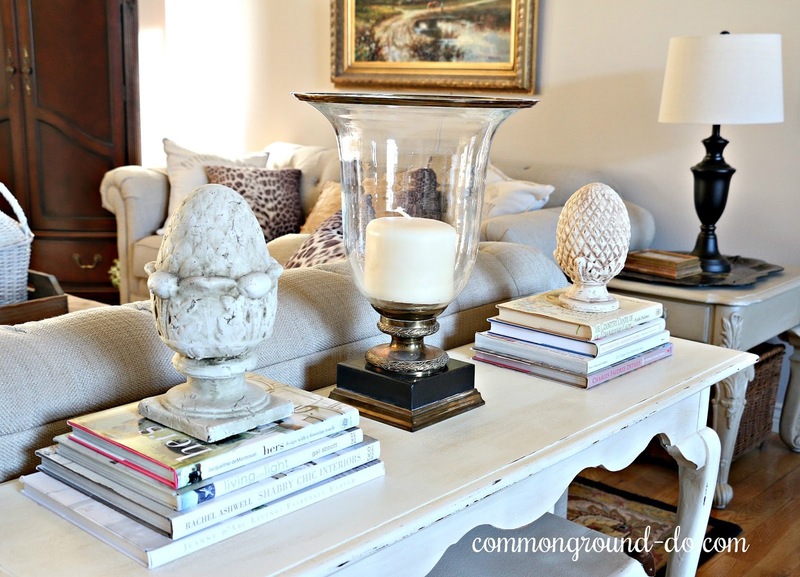 The coffee table, mantel and Entry area all have the same basic pieces I started with back in November. 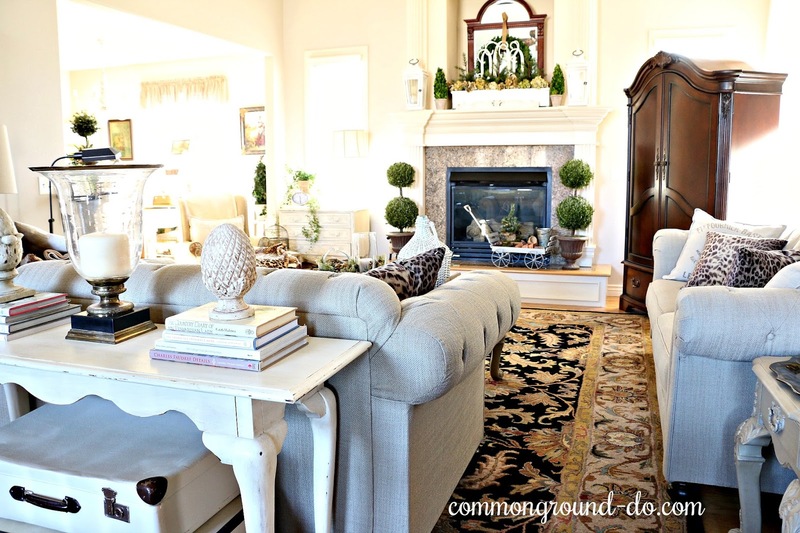 With the bold pattern of these area rugs, I would never be able to get to a totally neutral look here, but I try to keep all the other color to a minimum. 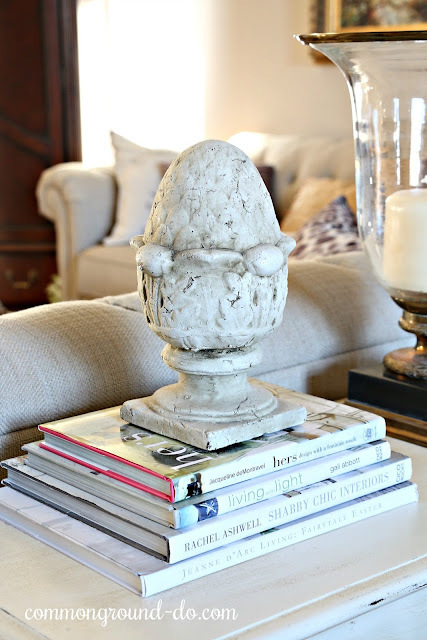 I love "color" as a partner to neutrals; like using red during the Holidays, but now that the winter season is here I enjoy using texture and pattern as my key decor elements. 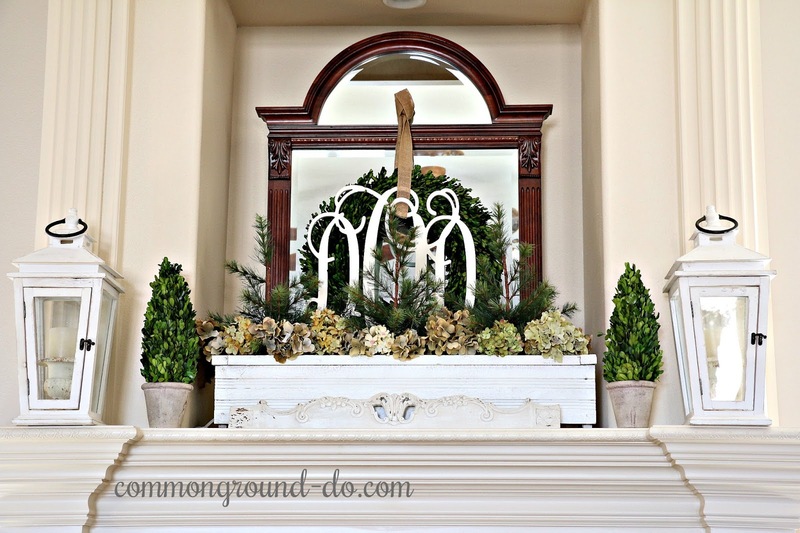 After Christmas I removed the lights, red berries and ironstone pitchers that had been here on the mantle to get down to my basic elements of evergreens and painted woods. My little gray French wagon is a little bare right now, but reflective of a winter's garden. It's waiting for Spring's arrival, where it will be filled with Spring bulbs, tulips and I'm sure a rabbit or two. I keep the Boxwood Wreath and our wooden signature Monogram here throughout the seasons. 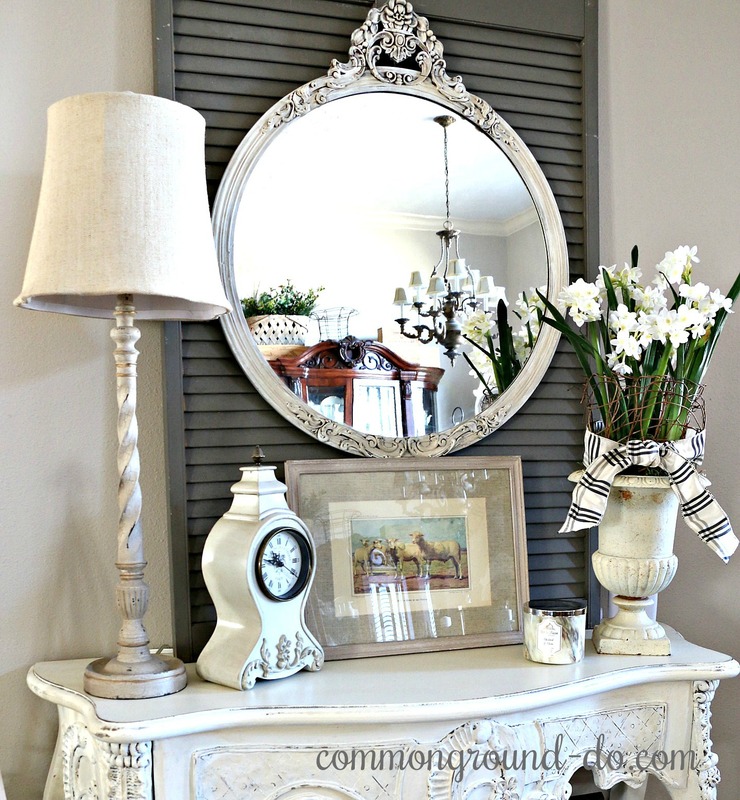 The mirror is bolted to the wall, so it won't accidentally go anywhere, but I always seem to be able to keep these elements relevant and working with whatever season I'll be decorating for. Because they are neutrals, they work throughout the year. This was an old window box that we'd had at our previous home, that had deteriorated so badly it was bound for the trash. I cleaned it up and Hubbs put in a few strategic nails and now I use it alot as a centerpiece for the Dining Room table. A small decorative element from a piece of furniture gives some extra interest up here. 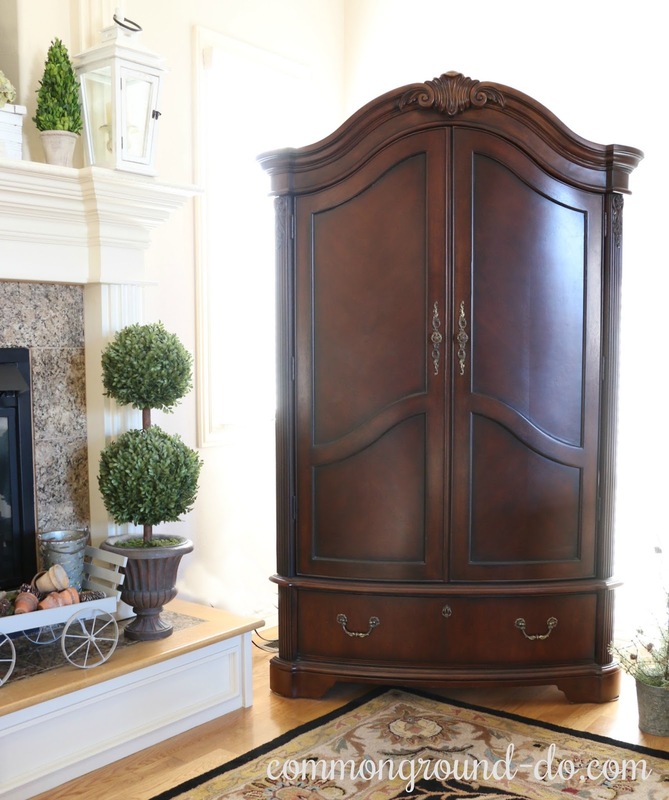 The armoire hides the tv during the day, since this is our main living area upstairs. We have a lower level family room that gets a workout with out of town family during the Holidays. 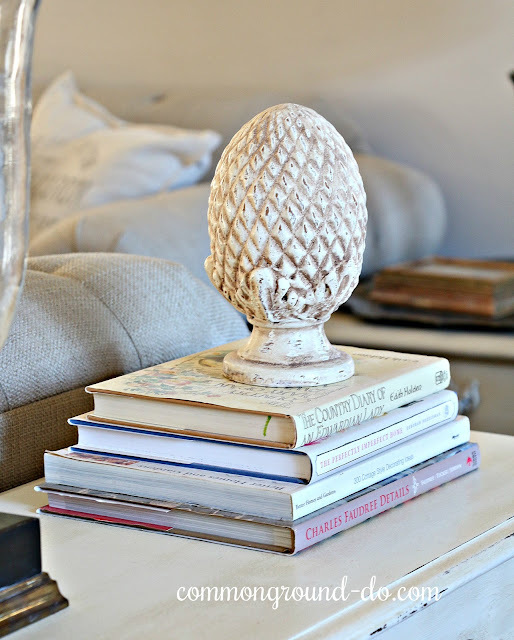 During the different seasons and Holidays I use a variety of different pieces on top of these book stacks, but right now I'm keeping them light and similar with 2 different clay pineapple finials. My white painted vintage suitcases are now a fixture under the sofa table. This little punched tin cupboard is a handmade piece I've had for years. I was debating selling it when we moved but thankfully kept it. Painted the same color as the other pieces, it fills a space that was missing something before. Two of my little collection of sheep. Here are a few pics of our Dining Room and Entry dressed in their Neutral Winter Decor. I'll be sharing more of these two spaces this weekend. Are you ready for some real vintage inspiration? Well, Click on over to Amber's blog, Follow the Yellow Brick Home. Amber has a beautiful home filled with her wonderful vintage style. I can't wait to see what she's doing this month! I hope you'll come back as a regular reader. I have several ways that you can make sure you receive all my posts, on the sidebar by email and through Bloglovin, Google +, and Pinterest at the bottom of my blog. Here's the list for the week. 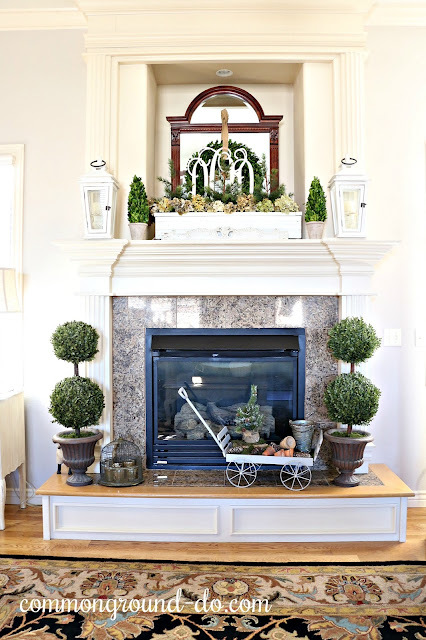 Be sure you head over to see Amber, then catch up with the rest of the group to see their ideas on Winter Decor. 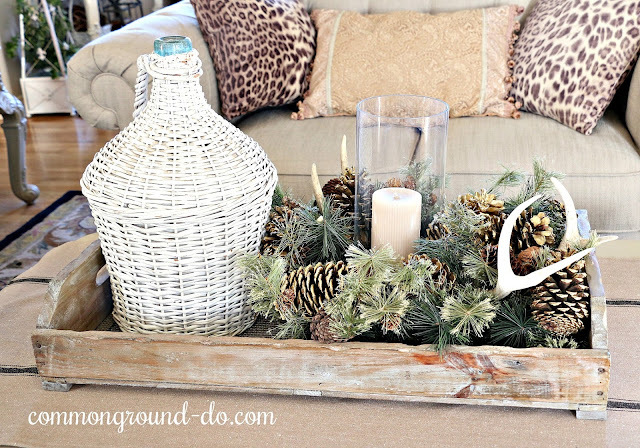 Thank you Kathy for hosting and putting this fun Winter Blog Hop together. 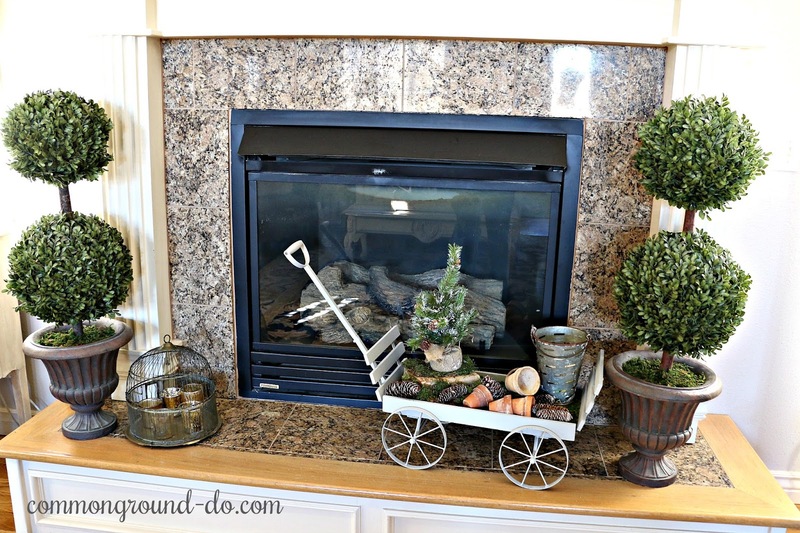 to link up your own posts on Winter Decor! Your style is so pretty no matter the season. You are smart to layer decor so it is easier to transition. I am STILL taking Christmas down but have "winterized" the whole main floor and am sharing that too. Have a beautiful day, Debra. Your home is beautiful and I love how you style vignettes. 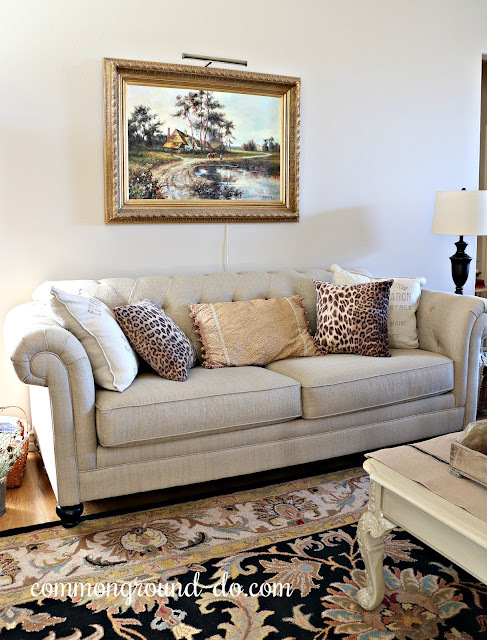 I love the leopard print and definitely agree it falls in the neutral category. Such a beautiful tour! 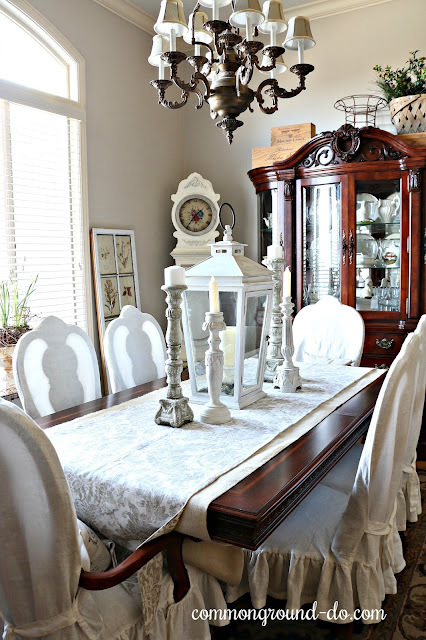 I love your dining room table and how you styled it! 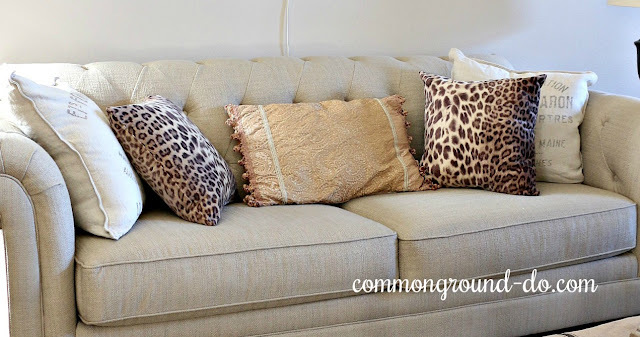 I also love the animal print pillows and throw. They work beautifully!! Debra, your home is absolutely gorgeous! I love your elegant style! Everything is so cozy and pretty, Debra. 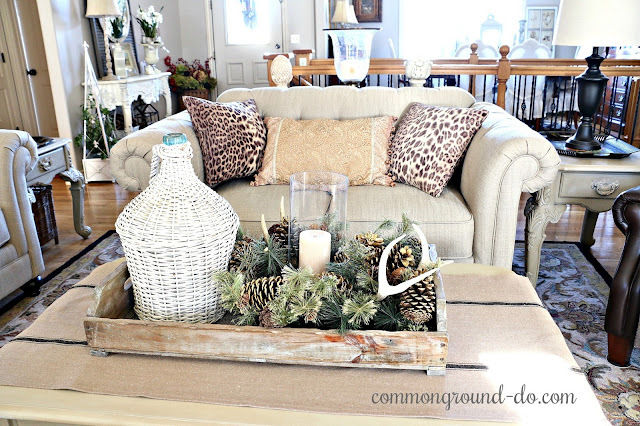 I love the animal print throws mixed in with neutral. Like you, I enjoy neutrals whether they're gray, white, even creamy beige tones but I like adding bits of color and pattern in with it. 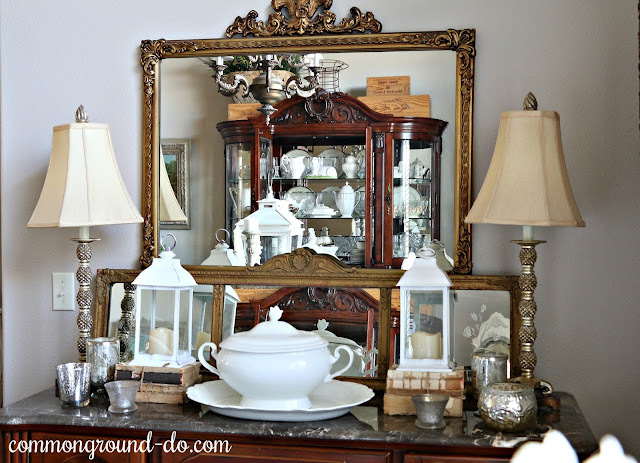 And those gorgeous gilded mirrors on your buffet are incredible! Debra the animal print! I am wild about it! 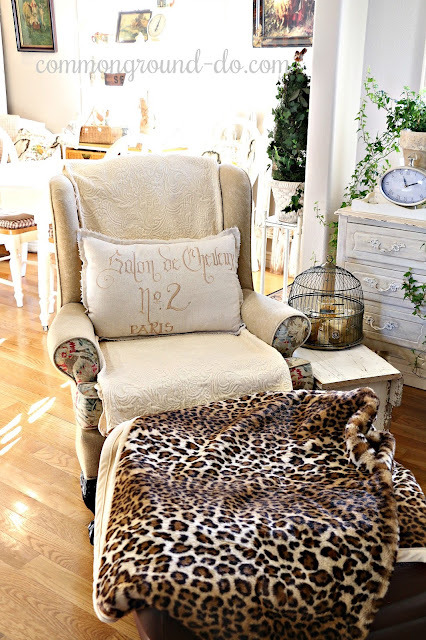 Gosh, I had some leopard throw pillows I had forgotten about and I could have used...you have inspired me! Love everything about this tour. 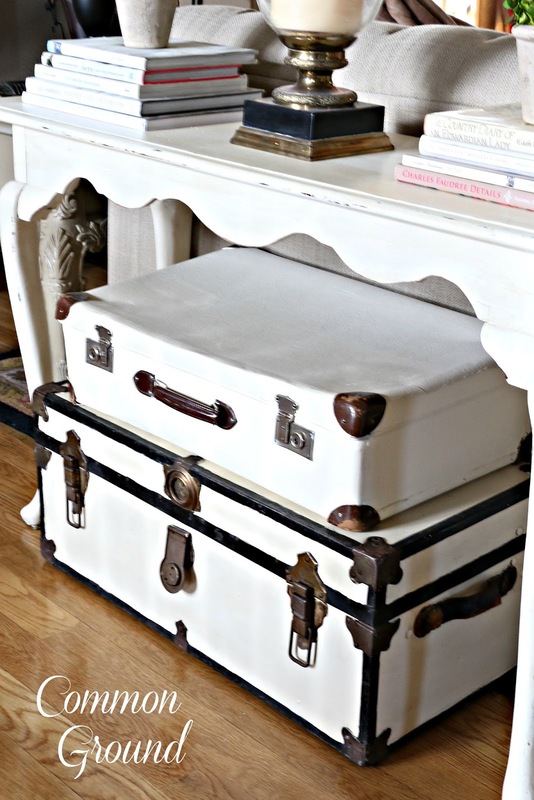 I have always loved your white suitcases, but somehow I had missed that they were painted until this tour. Wow...I am really going to have to borrow these ideas, with credit to you of course! 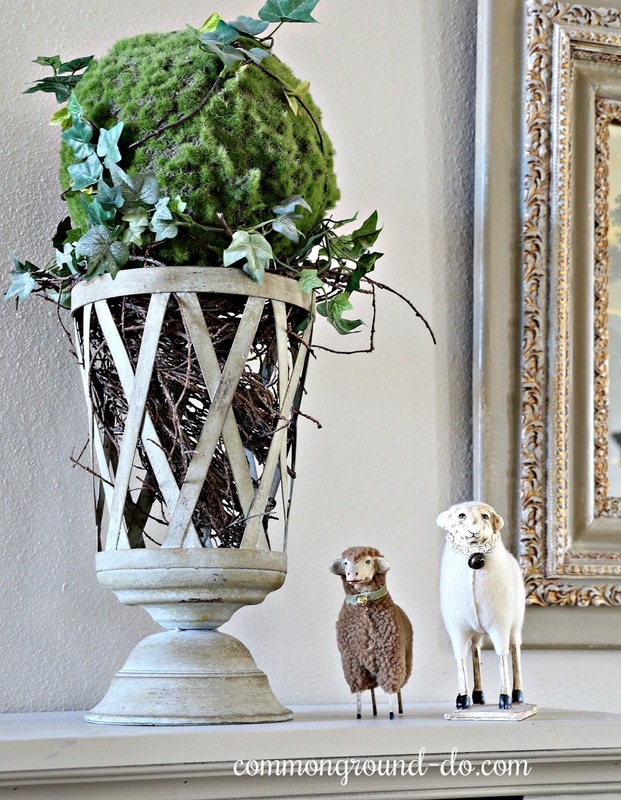 I really love the urn with the moss sphere, and the little lambs. 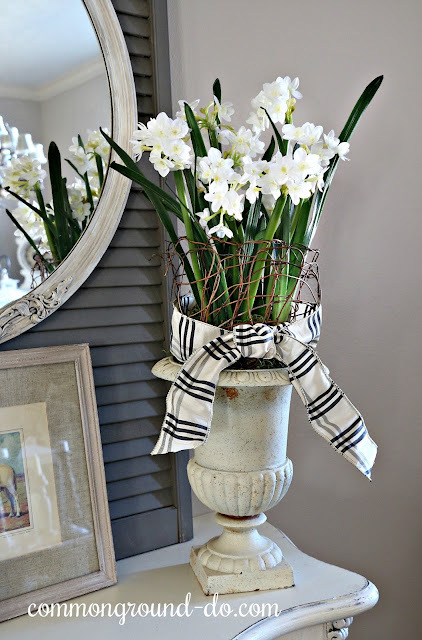 I enjoy that I have followed your blog for so many years, that I recognize some of your beautiful treasures that you have had for a while and it is fun to see how you use them again and again in new vignettes and they are always so fresh and creative each time. 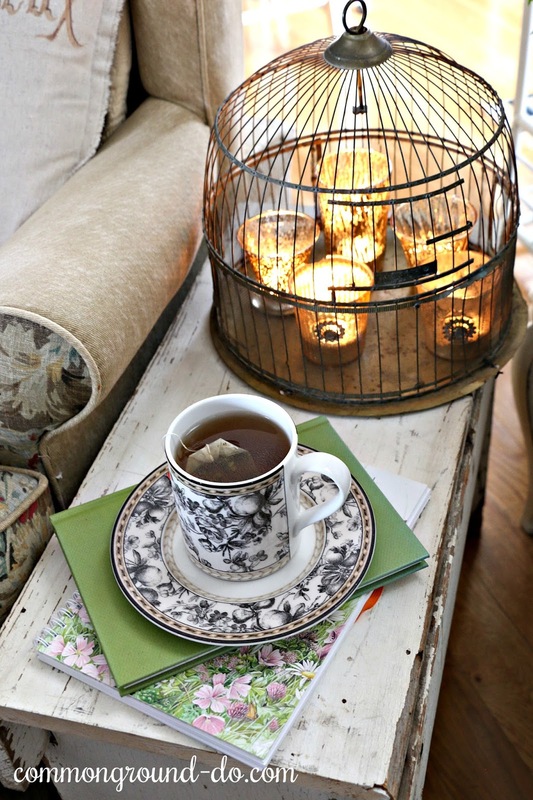 It is like being at a good friend's house...which is how your home always makes me feel! Happy winter Debra, enjoy your cozy home! I like the way you categorized the people who love neutrals, Debra. I'm with you on the last point. I don't mind a mix of shades, and I think texture makes all the difference. Subtle pops, like your leopard throw are a huge dynamic and show off your personality! I love this tour, and I love the way you've made the rooms flow seamlessly. I'm up in Michigan for a much needed break. We tossed the tree at home in Chicago, but the rest of Christmas is still up!! Gosh! Hopefully I'll be in a better mindset to get it stored away and start afresh when I get home!! I like the feel of neutrals for winter, but I have to have a tad of color as well. Your home is very warm and inviting! Debra, I love all of it. You made your house look more elegant and rich. Happy new years. Debra, I am obsessed with your trunks!! !